I appreciate technological advances that make my life so much easier and connect me and my children to places we might never have a chance to visit, and to information we could never afford, if it were only beautifully bound between the covers of a book. I like the good that comes from having a personal computer and access to the internet. I don’t have a clue how “it” works, but the benefits to our homeschool have far outweighed any personal negatives we’ve experienced. One such benefit was the opportunity, these past few weeks, to use software from LanSchool Technologies. 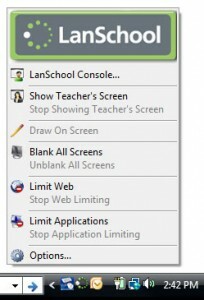 If two or more of your computers are networked together and they meet the system requirements listed here, LanSchool software allows you to manage and even monitor every computer in your classroom. The $99. perpetual home use license, allows up to three computers to be monitored and includes 3 years of tech support and upgrade protection. Click on the LanSchool logo below for a guided video tour. LanSchool Technologies is the award winning provider of classroom management software since 1986. There is a license for every need, from small or large, private and public classrooms to non-profit and corporate use. You can access a fully functioning 30-day free trial for your classroom and if you are a teacher, tech coordinator or administrator, with a valid school email address, you may sign up for a free copy of LanSchool Home. We have two computers in our home utilized, on occasion, for schooling, they are located in the main area of the house and are about five feet apart. At this time, I find it difficult to use our LanSchool software to it’s fullest potential. It is easy enough for me to verbally make assignments and keep my students/children on track. We are basically a one-room schoolhouse! I think this would have been more of an asset to us, if our home were larger, or multi-level and if, we had children that made use of the computer in a less public area. Since I can’t foretell the future, I’m glad LanSchool Home is a perpetual license. Using state-of-the-art-cool technology, I’m equipped to monitor and protect my family’s computers, as the need arises.